ELK GROVE, Calif., January 2, 2018	(Newswire.com) - Glen Padayachee is considered the country’s new face of civil rights amongst today’s professional employment and civil rights groups. As the head of EEO and HR Consultants, Padayachee today announced the nationwide launch of the 2018 HARASSMENT ENDS NOW Campaign. Sexual harassment and discrimination remains a growing epidemic in this country and employers are scrambling to find a solution to this crisis. Employers have an affirmative duty to train and educate their managers and supervisors on how to prevent harassment, to take immediate and appropriate steps in stopping misconduct and to protect their employees from unwanted and unlawful harassment. 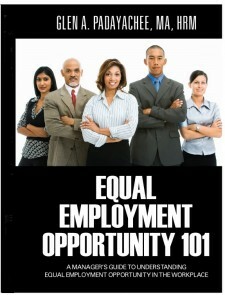 Glen Padayachee’s new book “Equal Employment Opportunity 101 – A Manager’s Guide to Understanding Equal Employment Opportunity in the Workplace” is a must-have tool for every employer; key concepts, real-life examples and best practices noted throughout the book will (if followed) create a healthy, positive and productive workplace. A healthy and harassment-free workplace, one that is promoted and supported by educated and knowledgeable managers and supervisors, will reduce and/or eliminate an organization's exposure to liability for harassment claims. The areas covered in this book are the most fundamentally essential and critical competencies that every manager and supervisor should be aware of. While organization policies are important, the scenarios and situational examples provided throughout the book are “real-life” challenges that managers and supervisors are faced with on a daily basis. This book, the cornerstone of the campaign’s commitment to end harassment, is the best and single-greatest resource for managers and supervisors on effective ways to avoid allegations of sexual harassment and discrimination. This is more than a campaign says Padayachee, “It’s a movement; a million-manager march.” Working together with public and corporate organizations across the country, we can achieve a healthy, safe and harassment-free workplace and give back to individuals the dignity and respect they deserve. We want every organization to join the movement, be part of this national campaign and share the commitment to end sexual harassment and discrimination. We begin by encouraging employers to educate and train their managers; our mission and our message is for every employer to provide a copy of this book, Equal Employment Opportunity 101, to their managers and supervisors. Equal Employment Opportunity and Human Resources Consulting.